Wolf Hoffmann (born 10 December 1959 in Mainz, West Germany) is a German guitarist, primarily known as guitarist in the German heavy metal band Accept since 1976.In 1997, he released the album Classical with rock versions of classical pieces. He contributed to Skid Row vocalist Sebastian Bach's solo album Bring 'Em Bach Alive! and to a 2000 Japanese tribute to Randy Rhoads album called Randy Rhoads Tribute with Sebastian Bach on "I Don't Know" and with Joe Lynn Turner on "Diary of a Madman". Hoffmann also contributed to Peace Breaker by Skew Siskin.He has loved photography as a hobby early on, and eventually made it his second career. He took the cover photo for Objection Overruled. During Accept's hiatus from 1997, Hoffmann has worked as a professional photographer (website listed below). 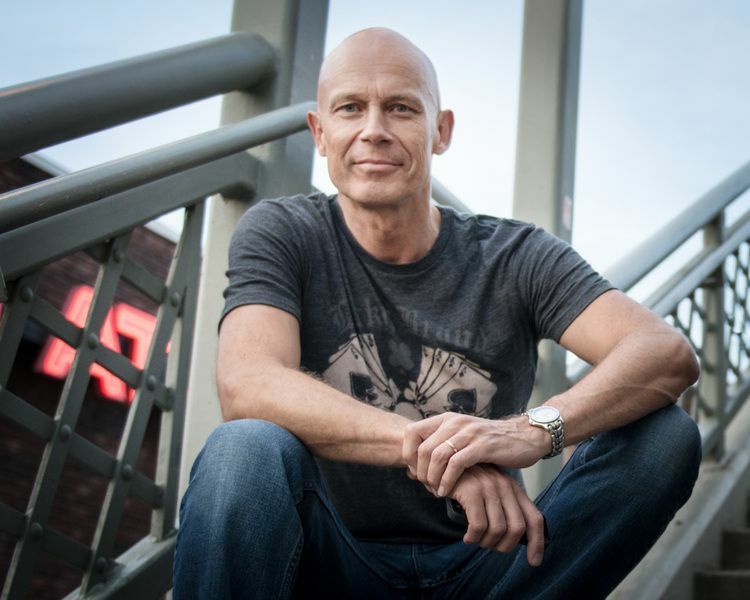 He is currently based in Nashville, TN, but also maintains a residence in Berlin, Germany.Wolf Hoffmann is married to Gaby Hoffmann (née Hauke), who used to be Accept's manager. Gaby Hauke contributed to Accept's songwriting under the pseudonym Deaffy.Accept reformed with Hoffmann on board in 2009. Their comeback album, Blood of the Nations, was released on 20 August 2010 to overwhelmingly positive reviews. 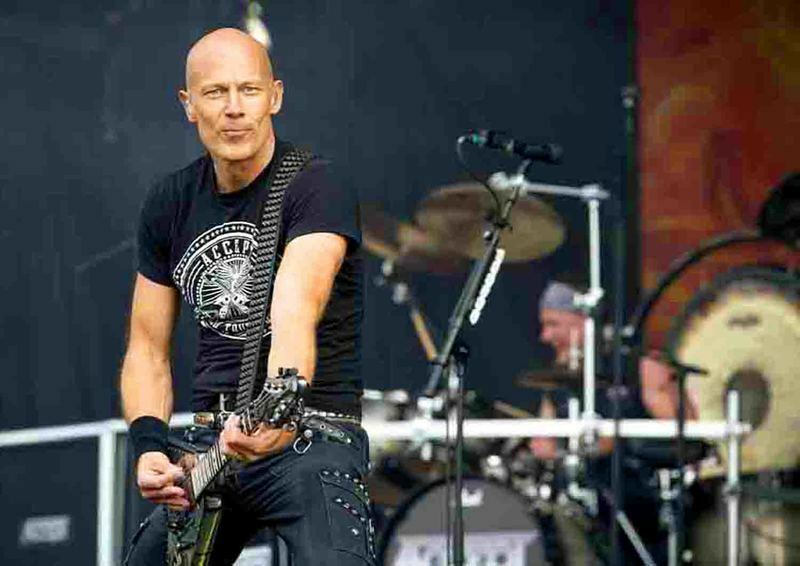 A follow-up album, Stalingrad, surfaced two years later, which also was highly praised.On 27 November, during an Accept show in London, Wolf revealed in an interview with Blackdiamond that he was working on a new solo album, which will probably be another in the Neo-Classical Metal style, as his previous Classical Album was. He also stated that this album will probably be ready to be released in 2015 but did not mention a certain time. 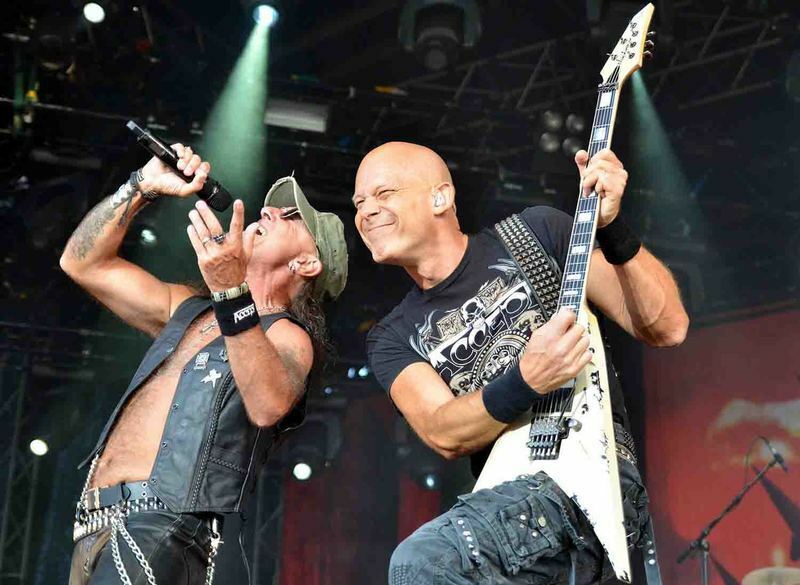 Best known for his lifelong work with Accept, WOLF HOFFMANN is back with his second solo offering "Headbangers Symphony" to be released tomorrow. A brave album by Hoffmann that is a result of his passion for metal and classical music.Not too long ago, Florian Magnus Maier (Non Euclid, Alkaloid, and the Hungry Gods) pointed out that metal and classical have a lot in common in regard to poly-rhythms, poly-tonality and virtuosity. He added that the difference between genres is a matter of instrumentation and that metal is a lot more flexible than say, pop music for example. "Headbangers Symphony" is Hoffmann’s newest endeavor into a world where metal and classical sound great as a marriage between the two. There was a lot to be excited about this album. The guitar goodness of Hoffmann combined with classical sounded like a great deal. Well, it is a great deal!The record opens up with Beethoven’s 9th symphony 'Scherzo'. This one resembles the opening riff from Accept’s track 'Teutonic Terror'. As a casual listener, you will definitely feel like you’ve heard all of this somewhere and it all comes back to you. You would love this record. You would enjoy the textures in the music. It is definitely a headbanger’s delight all the way.While listening to 'Night On Bald Mountain' is like seeing images of burning magma upon a high mountain, with a very strong wind. A strong performance by Hoffman. It is an absolutely a great version of Mussorgsky’s composition and Wolf was brilliantly successful to connect it to the next song by an invisible bridge, made not by music but by feelings.In 'Double Cello Concerto In G Mino' Wolf delivers a headbanging version of Antonio Vivaldi’s masterpiece, with almost the same name. The coordination between Wolf Hoffmann’s guitar and other instruments, especially the orchestral ones, is stunning.However, not all it's classical tinged. 'Les Pêcheurs de Perles' is one of the most famous and emotional pieces in Western opera by Georges Bizet. Wolf Hoffmann’s adapted version of ‘Act 1’ of this masterpiece, ’Je Crois Entendre Encore’, with a total bluesy perspective. 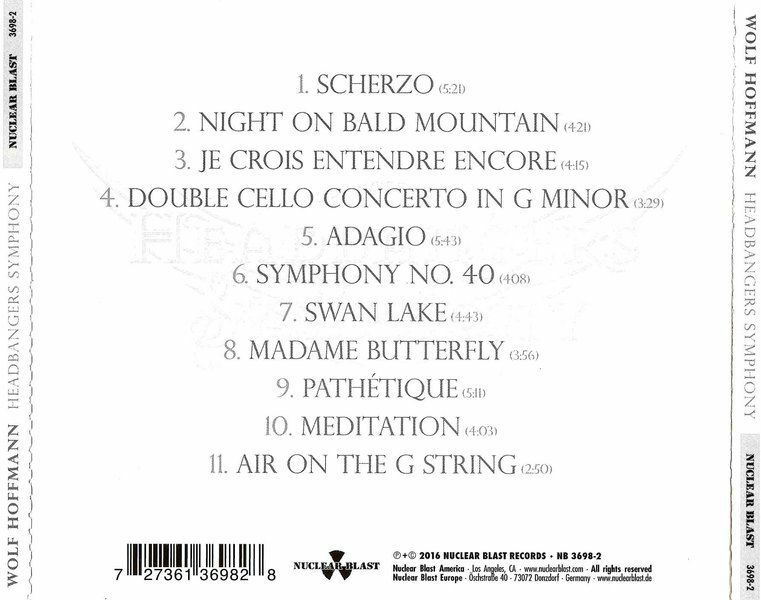 Terrific.The sixth track in the list, ‘Symphony No. 40’, is my favourite one and after lots of efforts of searching different dictionaries I still cannot find the words to describe it. This masterpiece is ten times more magnificent than magnificent with indescribable elegance. This adaptation of Mozart’s ‘Symphony No.40’ will give a huge amount of joy to both classical music lovers and also metalheads around the world.Jimi Hendrix was the first one who could sing with his guitar, Ritchie Blackmore was the next one and Wolf Hoffmann belongs to the next generation and to those where not many can do the same.And that is the most necessary skill for playing tunes like ‘Adagio’. I have always thought that Tomaso Albinoni was a kind of super-human or an alien as I can hardly believe his ‘Adagio in G minor’ is a work of mankind.Indeed, Wolf Hoffmann was successful to create a new version of this masterpiece with his signature of playing the electric guitar and the instrument arrangement. Absolutely loyal to the main theme, but he manages to bring more emotional feelings into it. 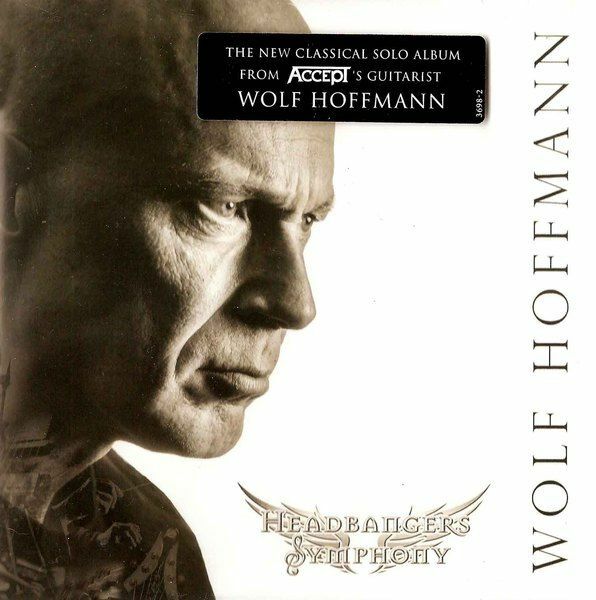 "Headbangers Symphony" is a stellar effort that showcases the best in Wolf Hoffmann. Love it or hate it, this album will still give you a kick. Hoffmann’s mastery, passion and prowess are beautifully articulated all over here. Brilliant production does justice to everything that Hoffmann strives to do. It really does pay to work with a live orchestra for an album of such diverse proportion. One might have issues on the classical side of things but you can never hate this album on the metal side of things. What makes this album essential is that it works as a great introduction into classical music for the ones who found classical boring. When do listen to what the album has to offer, you would certainly feel like you’ve heard the music somewhere without finding yourself in uncomfortable territory. Unfortunately, that track did not even make it onto the album yet because there were some legal issues. It’s a great track which broke my heart that we couldn’t make it on the album, we will release it soon. It’s Romeo and Juliet, by Prokofiev, it’s ‘Dance Of The Knights’, it’s almost one of my favourites and Devin Townsend played an amazing bass track on it.